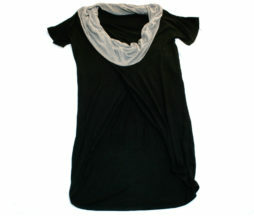 Super long jersey t by Mint for Sixh. 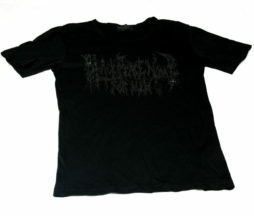 This shirt features draw-string adjustment at the sides for length and volume, a vertical mesh panel covers a black fabric printed with silver music note design down the middle front. 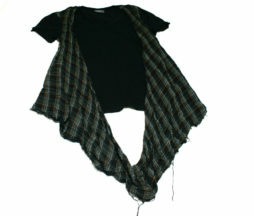 This item is used and has some discoloration around the neckline as well as some loose stitches in the drawstring cords. Please be sure to check the detail photos! This shirt is made of a sheer material and is really great for warmer weather. Worn with a contrast colored tank top or t-shirt popping through it has a lot of visual interest and can make the warmer months a little more fun. The body is darted for shape. This item is used and there is a darkening in the material around the collar which is not very noticeable due to the color, but please make sure to check the detail photos. This shirt has an attached scarf/drape which is in a traditional Japanese design, I really love the colorway of that piece. 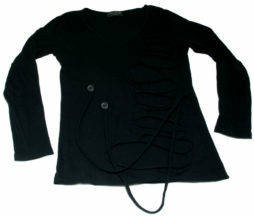 The attached piece has a raw hem and some stray treads are gathered there. Both the shirt and attached fabric are slightly lighter than usual so they wear quite cool in the warmer months. This shirt is used, but has no damage. This shirt features a narrow shoulder, high armholes, and a tapered body. The material is stretchy but firm. 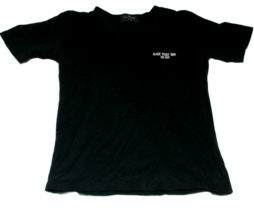 Front print is a stylized “Black Peace Now for Men” lettering in black which shines when catching the light. This item has been worn twice and shows no signs of wear. Crisp and unfaded blacks, no cracking in the print. This shirt is made of a sheer pinstriped material and is really great for warmer weather. Worn with a contrast colored tank top or t-shirt popping through it has a lot of visual interest and can make the warmer months a little more fun. Fabric covered buttons and darting in the body for shape. 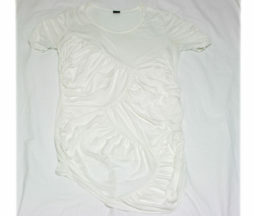 This item is used and there is a small stain near the collar which is very light but visible. I believe it was caused by a necklace rubbing against the fabric and transferring some color. Please make sure to check the detail photos. I really love BPN for Men’s T-shirts and I wish they had made more of them. 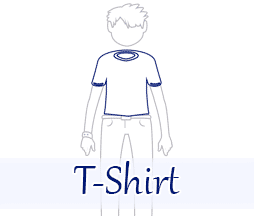 They have narrow shoulders, high armholes, and a tapered cut. 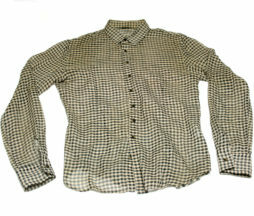 This shirt was in the first collection of the ‘for men’ label when it was introduced. The chest logo is embroidered with a silk screened wing print on the back. This item is used and has been worn though the black is still crisp and not faded and there is no cracking or fading to the print. 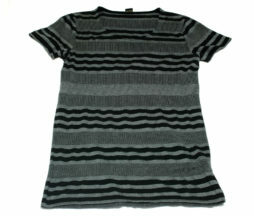 This shirt features alternating vertical and horiztontal stripes where the fabric of the vertical striped sections is actually ribbed giving an interesting look and feel to the fabric . Comfortable and soft. This item has been worn a handful of times but I can find no signs of wear. This shirt is patchwork sewn and full of volume. There is also gathering in the sleeves, it feels something like dressing up as a puffy cloud. There is a little bit of discoloration in the fabric around the neckline that you may be able to see in the detail photos. While this may wash out with specialized products, please be aware of it before buying! 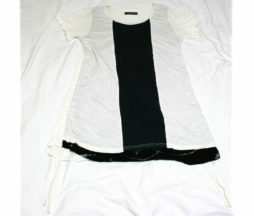 This item is a slim thin layering piece that looks really great with a contrasting color or white underneath. This item is used, but I can find no damage, the black is crisp and unfaded. 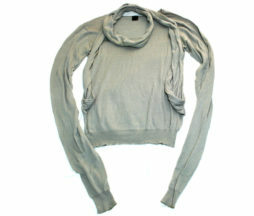 This is a cool layering piece which looks nice over a colored tanktop / contrasting grey. This item is used and there a bit of pilling in the back around the seat. Extra Long Sleeves and a scarf layer attached at the waist, this sweater can be worn in many ways, either simply or used to add some interest to your outfit. There is a button at the back of the neck to keep the scarf in place or get some freaky back drape. This item is used and has some discoloration around the cuffs. Please make sure to check out the detail photos. 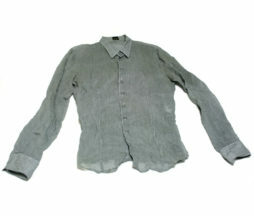 This shirt has been worn several times and shows a bit of yellowing around the collar. 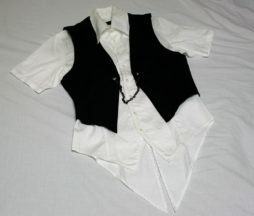 The vest is attached by two buttons on the face of the shirt and a chain is then hooked between them. Nicely designed with long thin tails on the shirt-back.